(Kansas City, Mo. – Feb. 5, 2018) RideKC is preparing for the possibility of ice and snow that may affect travel on Tuesday, Feb. 6. Keeping customers and employees safe is the top priority of RideKC. 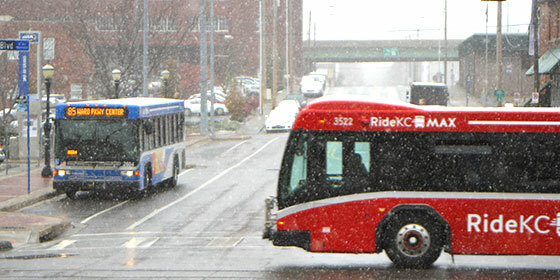 RideKC bus customers can stay informed about current conditions and plan for severe winter weather. Current forecasts predict the heaviest snow will arrive after noon on Tuesday, Feb. 6, with potential impacts on the afternoon rush hour. With temperatures below freezing, roads and sidewalks may be slick. RideKC plans to provide bus service Tuesday. However, as road conditions worsen, customers could experience delays. Please check www.RideKC.org frequently for updates. Paratransit service RideKC Freedom is using Phase A of the Inclement Weather Plan until Wednesday, Feb. 7. Paratransit customers may experience delays of 30 to 60 minutes past scheduled pickup times. Customers with non-essential travel are encouraged to reschedule their trips at (816) 842-9070. This storm has the potential to cause delays for RideKC service. Our crews will be working through the day to keep streets safe. We encourage customers to dress warmly, listen to local newscasts for up-to-date information, and use the online tools to learn if their bus is delayed.